the muliwai project: Here’s one of the projects I’m working on that begun during the federal recognition hearings this summer, which for various reasons is just being shared widely now. It continues to be a long-term, work-in-progress, collaboration. We look forward to posting more in 2015! For now, read our post on the federal recognition hearings and other forms of recognition between Pacific Islanders at home and in diaspora, and with other Indigenous peoples here. This website is a space for creative and critical reflection on Pacific/Oceanic sovereignties, relationships, kuleana, and genealogies. Sparked by collective concerns about the recent US Department of Interior hearings about the potential establishment of a “government to government relationship” between the US and the Native Hawaiian people, this website is a space for responding to, re-framing, and rejecting the terms of US federal recognition. It is also a space for acknowledging, reflecting on and building other modes of Indigenous recognition in and beyond Oceania. In that spirit, our website is named muliwai, meaning estuary or river mouth in English. For us, the muliwai’s meeting of fresh water and salt water symbolizes the greater Pacific connecting to the wai (water) of specific islands and peoples. Ma ka waha o ka muliwai – at the mouth of the muliwai – we find a place that speaks, takes in, emerges, embraces, loves, resists, is silenced by the sacred or sometimes by force. The muliwai is a murky and constantly changing place; a place of meeting and transformation; a mouth between the land and the ocean; a queer space; our space. The Department of Interior’s public hearings and comment period ended on August 19, 2014. Our project opens up in the aftermath of the DOI process which has been by turns inspiring, painful, beautiful, and panicked. Where eloquent testimony after testimony was cut off at the two minute mark in the Hawai’i public meetings, we insist that our words for recognizing ourselves overflow the time limits imposed upon us by the United States in multiple ways. We ask our readers to think with us: what (pleasure, politics, protest) can be done in two minutes? What can be done with more? And, thinking with the theme of muliwai, what can be done at the mouth, at the meeting of different elemental forces? This past week, my heart has been wrapped up in the public hearings being held in Hawai’i by the US Department of Interior regarding federal recognition for Native Hawaiians. There is so much to say about it that I am a little bit speechless. Perhaps it is more accurate to say that it is difficult to say anything about this process without saying it collectively, in conversation with other Native Hawaiians and allies of the Hawaiian independence movement. Here in California, where no public meetings are being held despite the fact that nearly 75,000 Native Hawaiians live in California (many of whom, myself included, would love to live in Hawai’i if we could), I have been watching the meetings online, streamed live by ʻOlelo community television. It is a gift to be able to watch the meetings but it is also wrenching and full of emotion. It is hard to watch alone. I see family and friends and leaders whom I admire. There are whole families who step up to the mic to testify: parents describing their pride in their keiki (children) who can speak ʻolelo Hawaiʻi (Hawaiian language) and learn Hawaiian history today when those rights were denied to them and their own parents. There is an infamous white retired philosophy professor who testifies that Hawaiian sovereignty is “ethnic apartheid,” while wearing an aloha shirt and a kukui nut lei. There is over and over again (probably around 90% of the testimonies) a very clear and intelligent statement of the fact that our nation exists, that our sovereignty separate from the United States has never been extinguished, that the answer to the federal governmentʻs questions about if they can “assist” us in establishing a government is aʻole. No. As I have been watching online, I have also been texting and tweeting and writing on Facebook, to share my reactions with other Native Hawaiians who are also watching from afar. At least two people I know have been gamely live transcribing the meetings as much as they can and posting it on Facebook for all who canʻt access the live stream. In between just sharing what is being said, we share our outrage (at said retired philosophy professor, for example) and pride and anger and hope, which is exactly what the people in the meetings we are watching are doing. We turn to each other and community public access television because the mainstream media is barely covering these meetings, and when they do, they are largely characterizing the meetings as a space of savagery- a space where rude, angry, yelling, “fringe,” Native Hawaiians are drowning out the voices of “moderate” Hawaiians. In this manner, the media reports only what it already knew about Hawaiians: that we are unruly, hostile, ungrateful and uncivilized. The mainstream media also thereby paints federal recognition as “neutral” or “rational,” when true reporting would be listening to the testimony after testimony that is very precisely and critically analyzing why that story about federal recognition for Native Hawaiians is simply not true. Though anger and occasional yelling are present in the meetings, they are certainly not the only story to be told. There is also singing, in joy and protest. There is also crying, at the injustice pressed into our bones for decade upon decade, and at the beauty of seeing elders and children state their minds. A man says, “To me, the overthrow happened yesterday,” and precedes to tell us about how his grandpa used to make ice cream for Queen Liliʻuokalani. “Conduct bemoaned,” says the Star-Advertiser. We know better. There is more to say and I am working on ways to say them in collaboration with friends and colleagues. For now I want to share some links, as many people, myself included, have been searching for ways to see the testimonies online (live and archived). I believe Akakū will also be livestreaming the Maui meetings July 5-8. Sept. 30, 1897, “Strangling Hands Upon a Nationʻs Throat,” by Miriam Michelson in the San Francisco Call newspaper. Many testimonies at the June 28, 2014 meeting on Molokaʻi quoted anti-annexationists quoted in this article. June 28, 2014, ” Hawaiian Sovereignty 101: The Growing Fight for Native Independence,” interview with Kēhaulani Kauanui, by Gale Courey Toesing, in Indian Country Today Media Network. June 27, 2014, “No Aloha: Native Hawaiians Against Interior’s Relationship Proposal,” by Gale Courey Toesing, in Indian Country Today Media Network. June 27, 2014, “Hawaiian independence activists won’t be silenced,” interview with Jon Osorio for Radio Australia. June 26, 2014, “Media Coverage of DOI Hearings Off Base,” by ‘Umi Perkins on his blog theumiverse. June 24, 2014, “Overthrow Redux?” by Judy Kertész in the Hawaii Independent. June 23, 2014, “Federal panel hears a resounding ‘no’ at Honolulu hearing,” by Ikaika Hussey in the Hawaii Independent. June 23, 2014, “So the Interior Department Wants Input on Hawaiian Nation-Building?” by Trisha Kehaulani Watson in Honolulu Civil Beat. June 22, 2014, “The Press for Native Hawaiian Federal Recognition is Presumptuous,” by Randall Akee in the Hawaii Independent. Monday, June 23 — Honolulu – 9:00 a.m. to 12:00 p.m.
Monday, June 23 — Waimanalo – 6:00 p.m. to 9:00 p.m.
Tuesday, June 24 — Waianae Coast – 6:00 p.m. to 9:00 p.m.
Wednesday, June 25 — Kaneohe – 6:00 p.m. to 9:00 p.m.
Thursday, June 26 — Kapolei – 6:00 p.m. to 9:00 p.m.
Friday, June 27 — Lanai City – 6:00 p.m. to 9:00 p.m.
Saturday, June 28 — Kaunakakai – 1:00 p.m. to 4:00 p.m.
Monday, June 30 — Waimea – 6:00 p.m. to 9:00 p.m.
Tuesday, July 1 — Kapaa – 6:00 p.m. to 9:00 p.m.
Wednesday, July 2 — Hilo – 6:00 p.m. to 9:00 p.m.
Thursday, July 3 — Waimea – 10:00 a.m. to 1:00 p.m.
Thursday, July 3 — Kona – 6:00 p.m. to 9:00 p.m.
Saturday, July 5 — Hana – 1:00 p.m. to 4:00 p.m.
Monday, July 7 — Lahaina – 6:00 p.m. to 9:00 p.m.
Tuesday, July 8 — Kahului – 6:00 p.m. to 9:00 p.m.
Tuesday, July 29 — Minnesota – 9:00 a.m. to 12:00 p.m.
Wednesday, July 30 — South Dakota – 1:00 p.m. to 4:00 p.m.
Friday, August 1 — Washington – 9:00 a.m. to 12:00 p.m.
Tuesday, August 5 — Arizona – 9:00 a.m. to 12:00 p.m.
Thursday, August 7 — Connecticut – 9:00 a.m. to 12:00 p.m. I have a piece up on the wonderful Decolonization blog today, kicking off a series on settler colonialism and anti-blackness. What famous Native American and Indigenous women do you know and treasure? Sometimes, non-Native people can only think of two historical figures: Pocahontas and Sacagawea. We should all know a lot more. This post is hosted on Storify. 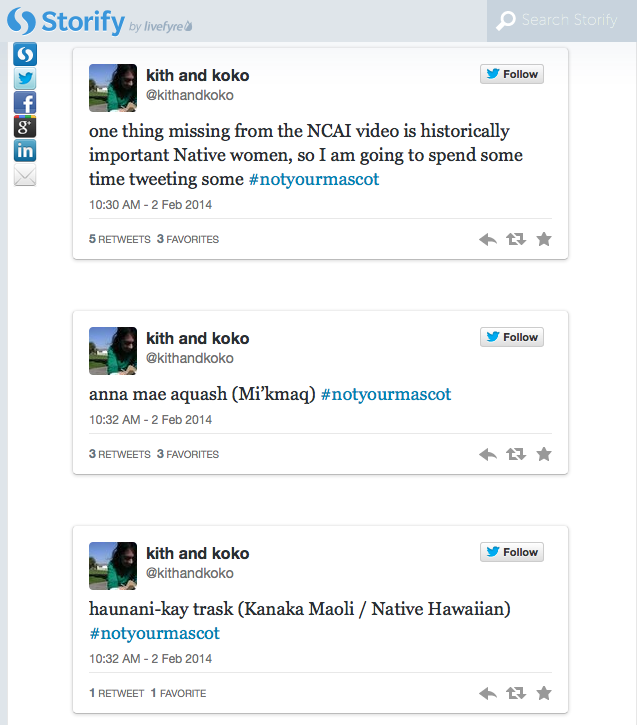 View the full post here: http://storify.com/kithandkoko/proud-to-be-native-women. I want us to teach each other the names of Native women who we should all know and treasure so it becomes less possible, less thinkable, to have a video about Native representation that cites the names of 10 Native American men and 0 Native American women. I’ve counted approximately 133 names here. They are leaders, activists, artists, warriors, teachers, scholars, filmmakers, novelists, poets, actresses, doctors, lawyers, queens and ballerinas. Some of their names I know well, especially those from my own Kanaka Maoli (Native Hawaiian) communities. Some of them I only discovered as I started to make this list. They are all women I am continuing to learn and care more about. Please help me add to the list. Maile Arvin is a Native Hawaiian writer, scholar, feminist and daughter. She is currently a UC President's Postdoctoral Fellow in the Ethnic Studies department at UC Riverside. Except where otherwise noted, all work is © 2005-2014 Maile Arvin. the maile vine by Maile Arvin is licensed under a Creative Commons Attribution-Noncommercial-Share Alike 3.0 United States License.